Varun Tej after scoring average success with Mukunda film has come up with another film 'Kanche' which is going to be directed by Krish. Kanche film is officially launched today after a formal Pooja. Miss India finalist Pragya Jaiswal is the heroine in this film. Kanche is the title confirmed by the makers. 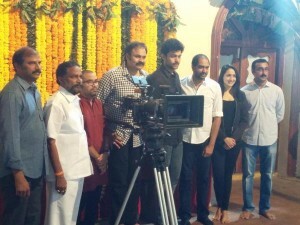 Sai Baba and Rajeev Reddy are producing the film. Kanche is touted to be a love story set in period backdrop. Looks like the film will be in the lines of Gamyam and Vedam. Varun Tej will kick start another film under the direction of Puri Jagannadh very soon which will be an entertaining subject.